The Anna is a spacious diaper bag, chic enough to transition your look from day to night. It has a patterned quilted nylon finish in versatile grey. The large front flap conceals three pockets � one of which is zipped - perfect for keeping mom�s essentials within easy reach as well as a side zipped insulated bottle pocket. The Anna bag also comes with a separate matching insulated FAB bag (food and bottle bag) which can also be attached to your stroller for quick trips out. Care Instructions: Wipe clean with a damp cloth and leave to dry naturally. Change mat - machine wash 30 degrees Celsius, dry flat. 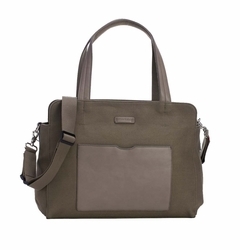 The Juliette in neutral Moss is Storksak�s newest hard-working and versatile classic tote baby bag. Crafted in coated canvas with PU (mock leather) detailing, the lightweight style features leather-look strap detail, logo plate and front pocket. Storksak diaper bags are THE premier designer diaper bags! This London, UK based designer specializes in high end designer diaper bags that you will often spot being carried by celebrity moms and dads. At Due Maternity, you will find every style that Storksak offers and they are stocked in our warehouse in California (some e-tailers drop ship these bags and keep you waiting for an overseas delivery!). Moms adore their satchels, hobos and totes and Dads love the unisex messenger bag styles. Many are big enough to fit a standard laptop, making them the most versatile bags around. Choose from bright colors and edgy fabrics or stick with the classic neutrals and blacks in supple leather...you can't go wrong with a Storksak. 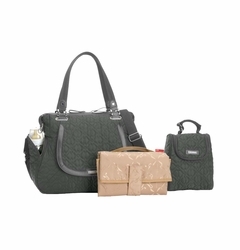 A gorgeous Storksak diaper bag makes the best baby shower gift!